It is a famously long, steep climb from Bath city centre up to the university but once you get there, it is more than worth the effort. Not only are the sports facilities here world class, but from 6-9 February this outstanding venue will be hosting the first Fed Cup tie to be held in Britain in 26 years. 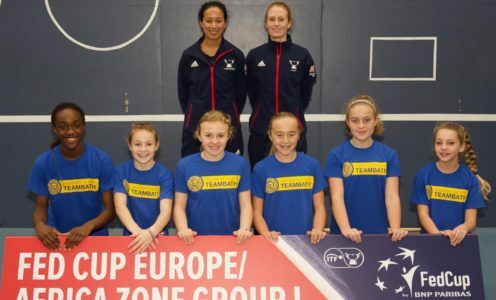 "It's going to be massive," says Anna Smith (pictured with Fed Cup Captain Anne Keothavong and Bath Academy players), the British doubles specialist who played in the event last year and using the venue as her training base. "The girls are going to get a real buzz off it. The atmostphere will be amazing." Launched in 1963, the Fed Cup is the women's answer to the Davis Cup and is the premier international team competition in women's tennis. Unable to play herself following surgery to both knees last year, Anna is gutted not to be playing but will be cheering the team on from behind the scenes. "Playing for your country is really special and playing in the Fed Cup was the biggest thing in my career. It is the biggest women's event we have in tennis and in world sport, so it is a great show case. I think girls are going to do really well." There are 8 teams in the draw, split into two groups of 4: Great Britain, Hungary, Greece and Slovenia are in group A and Serbia, Croatia, Turkey and Georgia and in group B. The winners of each group play each other on the last day for a place in the April play offs. The recently announced British team comprises Johanna Konta, Heather Watson, Katie Boulter, Harriet Dart and Katie Swan and among those likely to cause them problems watch out for Dalia Jakupovic, world no. 82 who heads up Solvenia and Timea Babos from Hungary who is part of the defending Australian Open doubles champion team. The event is split into morning and evening sessions with two singles and one doubles match a day. Away from the tennis, Bath itself is a fantastic attraction. Its status as a World Heritage site was one of the reasons the university won the bid to host the event, and one of the great things the Romans did for us was build a set of baths on Britain's only hot spring. Beautifully restored, the Roman Baths will be host to the candlelit opening gala the day before play begins. "I hope lots of women and girls will come and be inspired to pick up a racket," says Anna. "It was watching Wimbledon when I was about ten that make me want to take up tennis. Watching it on tv, with the grass and all the player, I thought the whole thing looked really cool and that's where I got my inspiration. If just one person takes it up after coming to the Fed Cup, that would be brilliant." If you would like to play in this outstanding venue yourself, join the Bath Tennis League. The courts are open to the public and we have a special 50% offer on the next round, starting on 24 January. Just use the coupon code BATH-SAVE at the check out here! As with all our leagues, matches can be played at any venue that suits both players.